Compliance with national and international regulations and laws is utmost important in business. Full compliance and good governance are essential for international corporations and in cross-border business. one the intricacies of intercultural communication. Compliance starts already when getting into the market, setting up local entities and continues in day-to-day operations. Agreements with business partners and customers have to be made in accordance to international law, incorporation processes have to follow national regulations, work and stay permits have to be applied, Manpower law has to be obeyed, accounting and tax regulations must be applied. In a foreign country like Indonesia this is sometimes a big challenge. Indoconsult's compliance team supports you from the beginning to identify relevant regulations and laws, give you practical advise on complying with them and helps you to implement relevant compliance processes in your company. For already operating companies we provide detailed compliance audits to ensure that your business is compliant with local regulations and laws. 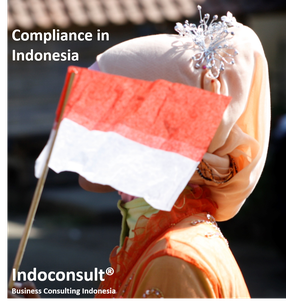 We support you throughout your business in Indonesia with actual know-how, practical advice and support on compliance topics. Our consultants perform audits, consult you on the current regulations, identify applicable regulations for your business and support you in implementation and training. Our experts ensure that your business is compliant with local regulations, international standards and corporate compliance strategies.